Ioannes Ricardus Pilger (natus John Richard Pilger Sydneii Australiae die 9 Octobris 1939) est diurnarius Australianus ex 1962 in Britanniarum Regno manens. Qui, ex primis annis nuntiorum belli scriptor in Vietnamia, externas Civitatum Foederatarum, Australiae, Britannarumque Regni rationes aspere iudicat, quas ab imperialismo compelli putat. Pilger praeterea patriae tractationem indigenarum Australianorum ususque mediorum usitatorum reprehendit. ↑ Anthony Hayward, Breaking the Silence: The Television Reporting of John Pilger, London, Network, 2008, p. 3 (no ISBN, book contained within Heroes DVD, Region 2 boxset). ↑ Trisha Sertori "John Pilger: The Messenger", The Jakarta Post, 11 October 2012. ↑ Markovits et Weintraub 2008. 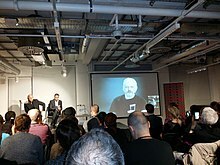 Ioannes Pilger, Ricardus Gizbert, et Iulianus Assange: profectio libri The Wikileaks Files (Londinii: Foyles), 29 Septembris 2015. Jones, Glen. 2014. Pilger, John (1939–). Screenonline. British Film Institute. Markovits, Andrei S., et Jeff Weintraub. 2008. Obama and the Progressives: A Curious Paradox. The Huffington Post, 28 Maii. Sutton, Candace. 2013. Aboriginal squalor among Australia's 'dirtiest secrets' says expat. The Australian, 1 Martii. Vicicitatio habet citationes quae ad Ioannes Pilger spectant. Novissima mutatio die 19 Septembris 2018 hora 16:01 facta.